The 1916 Harley built to be driven from the sidecar as it appeared on the day of the auction in 2006. Rare motorcycles are a mainstay at Wheels Through Time, from the ”World’s Rarest Motorcycle” the Traub to Oscar Hedstrom’s personal Indian, and Will Henderson’s 1918 four-cylinder prototype. As I like to tell visitors here at the museum, Dale has spent his life building not just a collection of random motorcycles, but a collection of the rarest, most desirable motorcycles. Perhaps one of the most unique motorcycles at the museum is one that most people probably walk right by. At first glance, the 1916 Harley looks like any other early motorcycle with a sidecar, but the careful observer will soon begin to notice some significant differences that truly set it apart. This motorcycle was a Harley factory-built special model, designed to be driven from the side-car, one of only two known models. To make this possible, the sidecar is wider than typical, and the handlebars have been custom made to sweep over to the correct driving position. A collapsible canopy would also protect the rider from inclement weather. 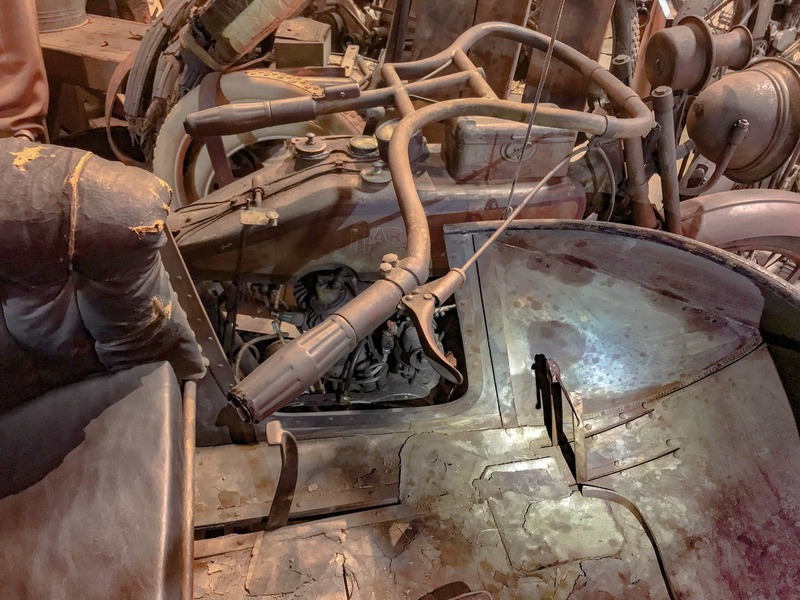 The throttle is in the typical right-hand handlebar location, but the brakes, clutch, and kick-starter have been moved to the floor of the sidecar very similar to the positioning in an automobile. The carburetor has also been flipped in position to intake air from the right side of the motorcycle which also allows for the rider to adjust the carb if necessary while still seated in the sidecar. 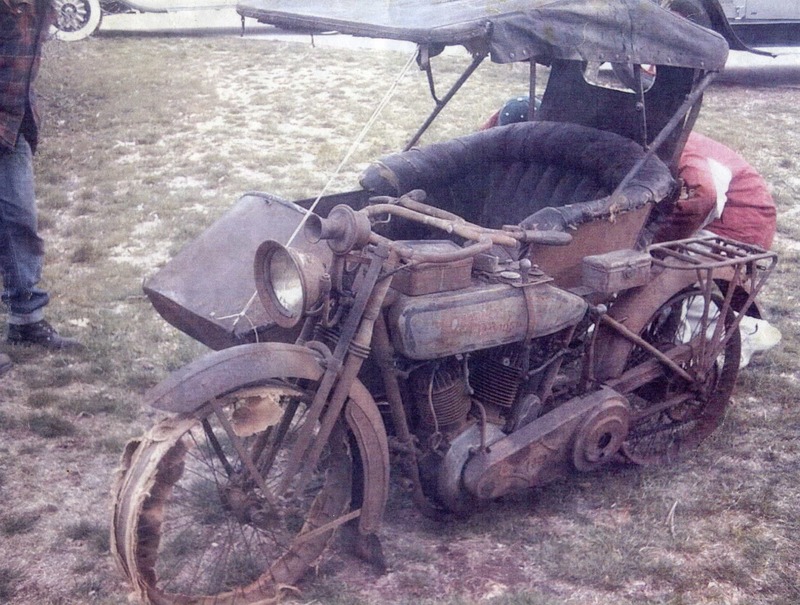 The motorcycle popped up at an auction of a collector named Hilbert Snyder in Pennsylvania in 2006. He had purchased the motorcycle out of New Jersey many years earlier while working at a Snap-On tool distributor. The bike was custom built by the Harley factory in 1916 and last tagged in its home state of New Jersey in 1921. It is believed that it was parked very soon after that and hadn’t been run since. The motorcycle is exquisite for its age, with the paint and the sidecar canopy top in excellent condition. A part of the ”Teens Shop” collection at WTT since then, it was one of the select few bikes that Dale had chosen not to do any work on. All that changed this season when Dale decided he wanted to see the bike running and driving. Dale and Matt set to work one day removing the dry-rotted and rock-hard original tires and replacing them with NOS period correct tires. The next day I joined in along with museum friend Buck Carson, and we set to work to get the motorcycle running. Because of the unique mechanisms that allowed the bike to be started and driven from the sidecar, it was necessary to remove the sidecar to have better access to the bike. We also removed the specialty kickstart cover and mechanism and installed a traditional Kickstarter plate. Now the real work began. We started with Dale’s hot-plate method to bring back the motor’s “memory” and started checking for all the essentials: compression, spark, fuel, and oil. Surprisingly, for the age of the machine and the number of years it had sat dormant the only real issue that gave us a challenge was in getting a spark. We traced the problem to the primitive ignition unit, a Remy generator that Harley only used in their bikes for 3 years. We removed it and replaced it with a magneto so we could move forward with the project. Next, the gas tanks and fuel lines were cleaned and cleared, and new oil and gas were added to the tanks. Now it was time to see if the bike would come back to life. Matt choked the carb and gave it three kicks and then turned on the switch. Two kicks later the bike fired back to life for the first time in over 95 years. I have to pause here and say that no matter how many times I witness such a moment there is still such a special feeling that happens when one of these incredible machines roars back to life. We continued to run the bike and dial it in throughout the day, and by day’s end we had the sidecar mounted back on the motorcycle. Next came the job of learning how to start the motorcycle with the floor mounted kick-starter. It took a little training and re-positioning, but we got it nailed down. The next day Dale and Matt took the motorcycle outside and drove it around the museum property. It was phenomenal to see such a rare and unique bike back out in daylight and on the road. The 1916 Harley Davidson Special Sidecar Driven motorcycle can be seen on display at the museum.